Are you building a report for a summer school project? For a mission-critical financial or healthcare system? For fun? Regardless of your end-goal, knowing how to build a report is the first prerequisite to distributing information effectively to your fellow humans. Modern reporting opens the door to using data from the latest data sources, creating beautiful visualizations, and sharing your creations using smart and powerful distribution methods. Setting up a reporting system is a process: Connect to data. Integrate data. Develop reports. Distribute reports. It sounds so simple, yet those who have done it, know it is far from easy. Too often the process involves writing painful integration code, multi-page queries, custom report logic, and applying a lot of technical “glue” to get things up and running. In this webinar, you’ll learn a highly simplified process for integrating data and distributing reports—and how it can be used to support many powerful reporting use cases. The Digital Economy was a term coined 1995. It's materialized, and the world is a vastly different place for everything from getting a taxi to buying a book. Now, here comes the next disruptor: the Algorithmic Economy. How do data scientists and business analysts get out in front of it? In this discussion, we look at the Algorithmic Economy and how you can embed and distribute analytics across all your data: big, streaming and anything else. Join Shawn Rogers, internationally recognised thought leader, speaker, author and instructor on the topics of analytics, big data, cloud, data integration and social analytics, and Alan Herron, analytics architect. They will take you through how the Algorithmic Economy will reshape our lives and impact our world for good. As we move into an era of positive disruption ― The Algorithmic Economy ― this is a session you just shouldn’t miss. Alessandro Chimera, Manufacturing Industry Expert, and Danny Stout, Sr. Solutions Consultant, TIBCO Software Inc. The current trend in manufacturing is towards tailor-made products in smaller lots with shorter delivery times. This change may lead to frequent production modifications resulting in increased machine downtime, higher production cost, product waste—and the need to rework faulty products. Watch this webinar to learn how TIBCO’s Smart Manufacturing solutions can help you overcome these challenges. You will also see a demonstration of TIBCO technology in action around improving yield and optimizing processes while also saving costs. The webinar also highlights customer case studies from our clients who have already successfully implemented process optimization models. The power of analytics cannot be denied, but the speed of response tells the tale of success. The faster you can change a business process to take advantage of your data-driven insights, the faster and greater the results. That's why operational intelligence can provide such bang for the buck: the benefits start accruing right away. TIBCO Connected Intelligence solutions connect data, systems, processes, and people—and it delivers predictive analytics, AI, and data visualizations for all aspects of asset management, customer information, distribution, forecasting, production, and supply chain. Wouldn’t it be great if you had a one-stop-shop, a single platform to connect data, systems, processes, and people? What if this solution could also incorporate predictive analytics, data visualization, and analytic actions for applications such as asset management, customer engagement, risk investigation, and supply chain management? 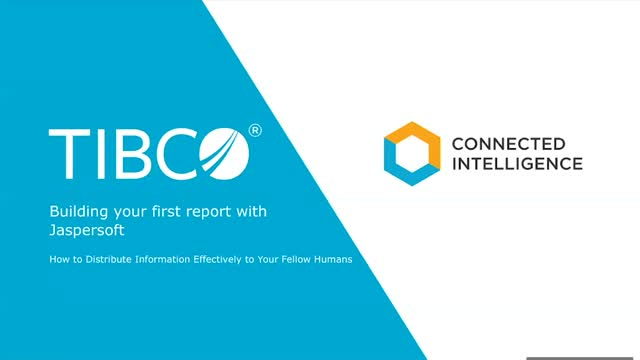 With TIBCO Connected Intelligence you can easily construct and embed visual analysis and machine learning models into business processes—and even into field equipment—for responsive batch and on-demand software action. Today’s enterprises are now required to evolve into the next phase of their digital transformation journey. This next step is driven by value transformation—and integration plays an important role. During this thought leadership session, guest speaker, Forrester Principal Analyst, Henry Peyret, author of The Forrester Wave™: Strategic iPaaS And Hybrid Integration Platforms, Q1 2019, discusses what this evolving landscape looks like, its key drivers, and what enterprises should consider to be successful. How does a modern city transform into a smart city? A city that would like to function as an integrated orchestration of people, processes, services, organizations and technologies to enhance living conditions has some challenges. What’s needed is an agile AI and machine learning-enabled ecosystem that can provide intelligent, connected and predictive services in healthcare, utilities, and/or transportation. Any integration project can have gotchas, such as custom fields or duplicate records that can slow you down. Proper up-front planning can help you successfully manage the gotchas, reduce the time needed and achieve better results. According to the newest research released by SITA, Blockchain is fast emerging among airports and airlines as the priority technology for making the travel experience more efficient. The most commonly expected use of blockchain is for passenger identification, with 40% of airlines saying it would offer a major benefit, and more use cases around passenger experience and airport operations are emerging. -A new business model where the traveller is highly connected. Can a blockchain be used to streamline airport operations and improve the customer experience? Increase security? -How can blockchain play a role in passenger identity management? What about issues like privacy, GDPR, and blockchain’s immutable behaviour (meaning no deletes)? -What is the role of consensus in an enterprise/permission blockchain deployment? What are some examples? Learn more about Project Dovetail™ at https://www.tibco.com/resources/community/project-dovetail. Data migration projects are growing more complex. With companies adopting more applications, especially cloud applications, and using more data sources than ever before, migrating just one system to the cloud can be a high-stakes, risky project. CRM Partners AG has a history of implementing successful migration projects, such as a recently completed project for a global manufacturer. Their methodology for data migration projects is designed to reduce the cost and risk they may encounter. A perfect storm of legislation, market dynamics, and increasingly sophisticated fraud strategies require you to be proactive in detecting fraud quicker and more effectively. TIBCO’s Fraud Management Platform allows you to meet ever-increasing requirements faster than traditional in-house development, easier than off-the-shelf systems, and with more control, because you’re in charge of priorities, not a vendor. All this is achieved using a single engine that can combine traditional rules with newer predictive analytics models. TIBCO Cloud™ Integration makes it easy for anyone to integrate business applications. From developers, to IT specialists, to daily business operations participants, everyone is involved with integration. One of the newest additions to TIBCO Cloud Integration is TIBCO Scribe® Software capability. Modern application architectures, Agile and DevOps SDLC, and supporting multiple channels like web, mobile, and IoT require you to reevaluate how you interconnect your systems and services. Noted development expert Frank Cohen, founder at Appvance, has recently released the 4th iteration of the PushToTest Integration Knowledge Kit. This Kit is a free open-source vendor evaluation guide comparing MuleSoft, Red Hat, Spring Boot, TIBCO, and others. You can get a copy of it in the attachments section. Join Frank for this short webinar (with Q&A) as he walks through the Kit and shows you how to use it to compare the top technologies for integrating your systems leveraging a modern architecture. -Which integration approach is most efficient in terms of developer productivity? -Which approach allows you to make changes most quickly? Within the energy industry, Exploration, Production, Refining, and Marketing each present unique business challenges. Analyzing the disparate data created and used upstream, downstream, and beyond poses unique IT challenges. With siloed data assets forming an often-untapped reservoir of business opportunity and insight, energy companies who successfully leverage them can gain a significant competitive advantage. •How to do this with all your data, no matter where it resides — upstream, downstream or anywhere across the globe. Business applications are evolving and user expectations for quality and easy-to-use software are at an all-time high. How do you build products and services that meet demand for both power and simplicity? In this on-demand webinar, we will explore how treating data as a feature can help product managers create indispensable applications that help users solve their most critical goals. As a bonus, special guests from experience-driven design and development firm, projekt202, will co-present on best practice methodologies for designing and building software that makes sense. Are your reports and data visualizations easy for your users to understand? Is the data you provide intuitive and usable on its own? Quality “data UX” is one of the most critical ingredients to effective information delivery. It is also one of the most difficult to master. Dr. Jenny Grant Rankin is an award-winning educator and author on data design. Join our webinar to learn her highly acclaimed standards-based approach to designing reports and data visualizations. Using these standards, you can effectively and consistently deliver information to users that is simple to understand and supports action. -What is Over the Counter Data and what are the standards? -What are the research-based statistics for using these standards? -How can you design reports that adhere to these standards? Strategic technology trends have significant disruptive potential. Developers and product managers who are invested in innovation will embrace a new wave of analytics and deliver even better insights, experiences, and overall value in their apps. Learn how TIBCO Cloud™ Integration with Scribe and other TIBCO products are better together than standalone. We'll show you how to aggregate data and manage changes to make data import in TIBCO Spotfire® more efficient. See how TIBCO Mashery® can manage access to the TIBCO Cloud Integration API (which also helps your customers and partners manage their integrations), control versions of individual API endpoints, and more. TIBCO fuels digital business by enabling better decisions and faster, smarter actions through the TIBCO Connected Intelligence Cloud. From APIs and systems to devices and people, we interconnect everything, capture data in real-time wherever it is, and augment the intelligence of your business through analytical insights. Thousands of customers around the globe rely on us to build compelling experiences, energize operations, and propel innovation. Learn how TIBCO makes digital smarter at www.tibco.com.